Peace, privacy and acres of natural space. The Midsummer Retreat certainly lives up to its name, set in a private space in a peaceful valley deep in South West France's Aveyron region. Exclusively yours, the Midsummer Retreat is for your sole enjoyment, no sharing with anyone but the wildlife which surrounds you. The Yurt which is finished to the finest detail, is set into the hillside, in the grounds of an old French farmhouse. Surrounded by trees, birds and flowers. The Yurt has wooden floors, antique tribal rugs and an eclectic style decor. The large double bed has its own removable panel above the centre of the yurt, allowing you to lie back in bed and watch the stars. There is a sofa/daybed which also doubles up as 2 single beds for children. All bedding, towels and soaps are provided. The Yurt sleeps up to 4 people, so ideal for a family to unwind in. The self-contained bathroom space has a large hot-water shower, a handbasin and flushing toilet. It also features recycled 16th century terracotta floor tiles found in an ancient forge along the river Aveyron gorge. The Summer Kitchen is a hand crafted wooden structure, crafted using Ash, Oak and Hazel from the sites own woodland. This space is furnished with French vintage finds and provides 26m2 of cooking, dining and lounging open-fronted space. There are also charging points for your electrical goods. The kitchen area is equipped with a gas cooker, fridge/freezer, microwave, electric hand mixer, a mix of pots and pans and utensils. The table and chairs allow for al fresco dining, whilst the drop down canvas sides of the Summer Kitchen can be completely opened, allowing you to be at one with the surroundings as much as possible. The lounge area is within the wooden cabin, making for a welcome escape from the summer heat. The river is only a 10 minute drive away at St Antonin, where you can enjoy swimming or a river side picnic. If you prefer a less wild swim, the outdoor pool there provides dramatic views of the Gorges de l'Aveyron. St Antonin has a thriving local market on Sunday mornings where you can buy wine, freshly baked bread, local produce such as olives, cheeses etc... there are also a number of restaurants and cafes with wifi, a bank, laundrette, supermarket, a post office, a cinema and bike and canoe hire. Walk in the surrounding valleys, whilst buzzards swoop and cicadas sing or explore the surrounding villages and the local cafes. Enjoy relaxing on site, where you can collect eggs from the free range hens or pick organic herbs from the garden, or just sit back on your terrace and enjoy the peace and tranquility of this hidden escape. A secluded yurt glamping getaway grown into the hills of the Aveyron valley near St-Antonin-Noble-Val in South West France. 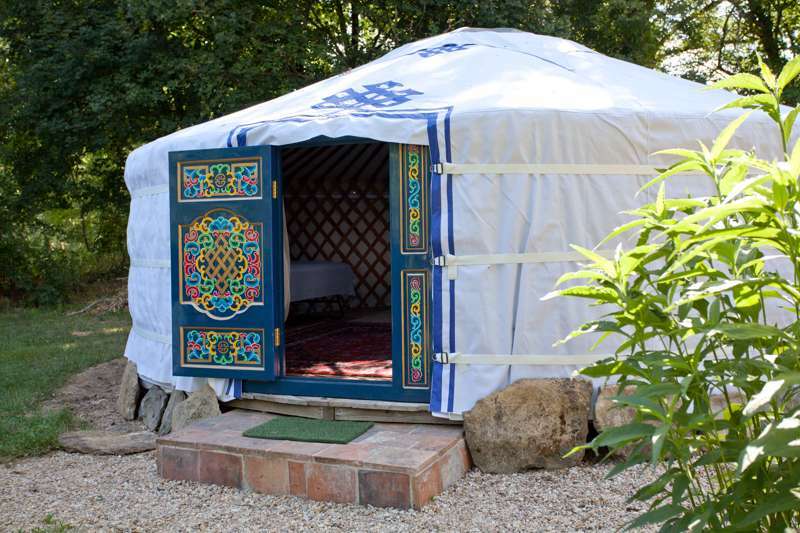 Beautiful authentic Mongolian Yurt with wooden floor, antique tribal rugs and decor, large double bed, sofa/daybed which also doubles up as 2 single beds for children, books, games, mosquito nets if needed. Linen, towels and soaps all included. Self-contained bathroom space with shower, hand basin, toilet. Kitchen area with cooker, fridge/freezer, crockery, cutlery and utensils, electric sockets, table, chairs and high chairs if needed. The front of the kitchen has drop down canvas sides so can be completely opened up if you like, allowing you to be at one with the surroundings as much as possible. Maps and guidebooks on local walking routes are found on the bookshelves at the campsite. This is real walkers' country and there are suitable footpaths for all levels. Swim in the river a short 10-minute drive away at Saint-Antonin-Noble-Val. Those too chicken to go in the wilds of the river water can use the outdoor pool there instead, complete with with dramatic views of the Gorge de Ayeyron. Canoes are also available to hire along the waterside in town, or follow the river's course from St Antonin past the ancient chateaux of Penne and Briuniquel by car, stopping along the way to swim on the natural river beaches. If you fancy whipping up a storm in the campsite kitchen (cupboard basics are supplied), head to Saint-Antonin-Noble-Val where there's a thriving local market on Sunday's – ideal for the freshest goods. The town also has two wonderful bakeries well stocked with French fancies, croissants and traditional breads, plus two good small supermarkets (open every day) for anything else. In terms of restaurants and cafés, Café De La Halle is the best for ice-cream, cold drinks and people watching in town. It's also great for those with children, as they can run about in the covered market nearby whilst you sit and laze with a drink. Go in the evening (after 7pm) for pizza. Le Festin De Babette (05 63 31 69 03), meanwhile, is the top spot for gourmet cooking. Ask for a table on their terrace and enjoy the view of town across the river. 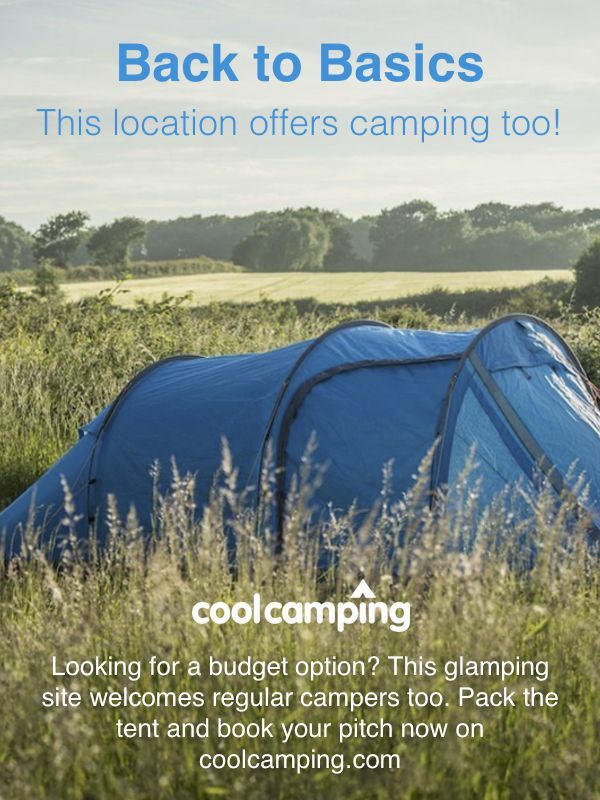 The Midsummer Retreat is a small, private glamping site at Sourrettou, so you'll only get the exact location and directions when you have made your booking. A single yurt sleeping up to 4 people.